If you have done any study on health, you are sure to have come across information about the health benefits of omega-3s. 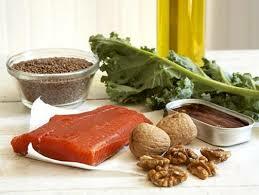 The lastest research has been finding that omega-3s actually may reduce your biological age. Telomeres are the end caps of chromosomes, protecting the DNA complexes from deterioration during cell division. Telomere shortening is considered a marker of cellular aging, and prematurely shortened telomeres have been linked to increased risk of cancers, heart disease, dementia and death. Nathan O’Callaghan, from the Commonwealth Scientific and Industrial Research Organisation (CSIRO; Australia), and colleagues enrolled 33 men and women, ages 65 years and older, with mild cognitive impairment, assigning each to one of 3 groups: the first group received EPA (eicopentaenoic acid) omega-3 supplements (1.67 grams EPA & 16 g DHA.day), the second group received docosahexaenoic acid (DHA) omega-3 supplements (1.55 g DHA & 0.40 g EPA/day), and the third group received omega-6 linoleic acid (2.2 g/day) for six months. Now the above information may not make a lot of sense to you and that is ok. The bottom line is that many studies are showing that omega-3s have significant health benefits and may actually reduce your biological age. Who doesn’t want a younger healthier body, right? Nathan O’Callaghan, Natalie Parletta, Catherine M. Milte, Bianca Benassi-Evans, Michael Fenech, Peter RC. Howe. “Telomere shortening in elderly people with mild cognitive impairment may be attenuated with omega-3 fatty acid supplementation: A randomised controlled pilot study.” Nutrition, 3 Oct. 2013.